…and yet care fees means testing should be done only after an NHS health needs assessment. Over the past few years we’ve heard from hundreds of families who have an older relative needing full time care. Almost all of them say that the first questions they are asked by the health and social care authorities are about their relative’s money. The health and social care authorities seem to have made it a priority in many cases to do a financial assessment first and foremost. It means that anyone with savings or assets over the means test threshold will immediately be told to pay for care – when in fact the authorities should first assess people for their health and care needs. No one can possibly say whose responsibility it is to pay for your relative’s care until the full extent of your relative’s health and care needs has been assessed. This should be done by going through the NHS Continuing Healthcare assessment process. It is the outcome of this process that determines who pays for your relative’s care – not how much is in their bank account. Everyone who needs full time care and who has health issues should be assessed for NHS Continuing Healthcare. At the time of the Continuing Healthcare assessment, no one should ask your relative about their money. In the assessment, if the NHS assessor/decision-maker decides your relative is not a health service responsibility (i.e. ineligible for Continuing Healthcare funding) and if the local authority agrees with that, the local authority will by default be accepting responsibility for care. However, if this process has not been carried out properly, the local authority is in danger of breaking the law. Why? Because your relative’s care needs may be beyond that for which a local authority can legally take responsibility; it means the local authority will have failed to acknowledge the legal limit for local authority care that was reinforced in the Coughlan case. Plus, if the local authority does a financial assessment at the outset and starts asking your relative to pay for care, and yet it is later shown through assessment and appeal that your relative was eligible for NHS Continuing Healthcare funding all along, two things will have happened: the NHS will have failed to meet its legal duty to provide care, and the local authority will have acted illegally in charging care fees in the first place – including top-up fees. Do you need further help understanding how care fees and NHS funding work, and how to get through the NHS Continuing Healthcare assessment process? 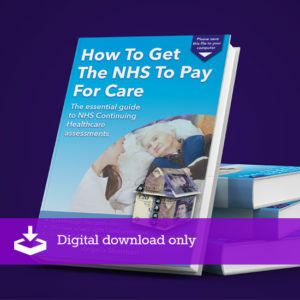 Our e-book, How To Get The NHS To Pay For Care, explains the whole process – with practical tips, advice and insights. My daughter’s partner suffered a severe stroke a year last Easter. He is about to be discharged from the Rehab Hospital. He has gone through the first assessment and scored four Bs and one A, which made him eligible for the full assessment, which he failed. He will be living with my daughter in her rented house – as he has done for the past 7 years. His own house was not deemed suitable by the Occupational Therapist. My question is does he have to sell his own house to fund his social care. My daughter has also been told he will not be eligible for reablement – 6 weeks free care, when he is discharged. I just wondered if you could point us in the right direction or have any nuggets of information for us-our mother is in care and has recently had a Continuing Healthcare/Decision Support Tool with a one person Multidisciplinary Team as well as a financial assessment some time afterwards-she has no savings and my elder brother owns half the house (nothing could be found searching land registry according to the finance officer) so is the house in or out of the assessment? Have been guided by your writings and both used them to good effect and downloaded them, in particular being page 9 of Care fees and NHS Continuing Healthcare and Age UK factsheet 38 but stumped as Social worker said house not in financial assessment but finance officer says her percentage is included in the financial assessment ? Hi my mother has been in a nursing home since March. We were advised by the social worker that she would have to pay fees as she has savings and property. We are still waiting for the Decision Support Tool meeting and the local authority are requesting payment of fees. Am I right in thinking as it hasn’t been decided Who’s responsible for the fees, that mum doesn’t have to pay… But who does? Sue – if your mum hasn’t been assessed for NHS Continuing Healthcare, get this process started right away: http://caretobedifferent.co.uk/getting-the-nhs-continuing-healthcare-assessment-process-started/. He had been receiving funded nursing care up to this. When he was first assessed he had savings over the threshold and social did not make make any contribution, but his savings are now down to <£15,000, social are aware but have not offered any financial help. A recommendation was made for a joint package of care, social services contribution 66% and health 34%. Now social have told us he will needs to have a means test done and his home will be considered as assets. Why is this, if it is a joint package of care?? My 93 year old father is currently in a care home he is very frail and has had a number of falls. He receives £112 pw from NHS funding and £451.91 from LA. Care home is £700 pw. He has no savings and lives in rented property. He got attendance allowance for looking after Mum (who now has dementia). He has a small private pension of about £50pw and then his state pension. We had to find a care home quickly has the Hospital could not keep him in any longer. My Mum cannot cope with him at home. I the daughter am only on a pension but having to find a top up of £285pw even after the home bought their fees down to £660pw plus my Mum will also need care soon. I have looked after them both for the last 5 years. I cannot manage it any longer. I just do not know what is going to happen as I cannot afford my Dad’s top up so there is no way I can afford both of them I am at my wits end. My father in law 95 was in hospital because of a urine infection he was hallucinating etc and when well enough to leave it was at the same time all family members were away/holidays so for piece of mind instead of having carers in his home we found respite in a care home. When back we came to realise he would not be returning back home as he would be at risk of falls etc. We are meeting up with social worker, met whilst in hospital, at care home tomorrow. We have no idea what to expect, what to do, where to go. Should we be paying for care as we have during respite or should we expect them to do so now? My husband was discharged from hospital after 7 months back in 2004, we were told at a multi -disciplinary meeting in the hospital that he would receive continuing care, he did for 5 years, then we were told he had to pay, it was not a huge amount and in my ignorance I assumed it was some type of admin. cost. Then in last year we had a financial assessment and his weekly costs have rocketed by 7 times the amount. I appealed of course but got nowhere and when I mentioned CHC was told “ring the hospital, we have no record of CHC”, but nobody can tell me why we didn’t pay for 5 years, this information being swept aside as irrelevant. My husband has deteriorated considerably over the years as he has a progressive illness and has developed other health issues. We are paying the fees but feel strongly that this is wrong but how to put it right when nobody listens. The various people you’ve been dealing with sound thoroughly incompetent, Molly, and I imagine that is making things very difficult – in what is already a difficult situation. The Continuing Healthcare Dept at the local Clinical Commissioning Group (NHS) should definitely have records of the previous CHC payments – as it will have come out of their budget. And it’s only if your husband’s care needs have actually reduced that the funding should have been removed. I would write a very strong letter to the chief executive of the CCG, and copy it to everyone involved. My motherin law has had previously been receiving Continuing health care following several years of hospitalisation and relapse. This is due to behaviour and mental issues. Recently an assesment has been carried out with my husband present. As of yet neither my husband or I have actually had written or verbal confirmation of the outcome yet we are being asked to provide financial details by my local authority. This suggest that a decision has already been made and that her care has been switched to social services. Is this correct. We are asking for further assessment as my motherin laws health has deteriorated. This is the wrong way round, Kerry, as you suspect. If you’re still waiting for the outcome of a CHC review, then it has not yet been decided who is legally responsible for continuing to meet care costs. Also, if there is no paperwork to show that the review has been conducted properly, including scope for the family to input into that, then it would seem flawed. I would refuse to provide any financial information until the review has been conducted properly. The council has put a “special projects manager” on the case of my father in law. He’s the one that was denied CHC by a single assessor that formed a Multi Disciplinary Team….. all on his lonesome. The clue is surely in the words Multi and Team. In the spirit of means testing; I asked her what right the council had to means test him after the NHS had removed his funding without doing it properly as is actually recorded to be the case. She implied that it would appear that they had no right to, as obtaining and subsequently retaining the data would likely be Data Processing Act offences. Ergo, to demand money based upon the illegal acquisition and processing of data is likely false accounting. That is a criminal offence. Follow the logic……. Illegally obtained financial data is not permitted to be processed. Processing it to create financial accounts, is the same as just inventing the amounts charged on the invoices because the data does not in fact exist because it is illegal for them to possess it and use it to create accounts. The problem that all involved has with this process is that when they step outside of the rules within the National Framework they run squarely into the realms of the civil and sometimes the criminal law. Then they state that they don’t have to obey anything except the framework when it is in fact their often faulty internal training manual that they are actually operating in compliance of. They also add that they do not know anything about law. Instead they try to defend themselves by stating that they don’t know about it as if that is a defence. Try getting away with that defence the next time the cops stop you speeding. This is exactly what happened to my mum – a Multi Disciplinary Team of one! They have eventually admitted to not abiding by the Framework and re-assessed finding my mum eligible. Just got to get the money out of them now! Next time they say they no nothing about the law, point out that ignorance is no defence. In British law, you cannot use the defence that you did not know something; you are still guilty and can be found guilty as though you knew it – that may make them sit up and think. When my father was being financially assessed I advised them that I was in the process of applying for full CHC. I was told he would take as much info as we had and then ‘keep on file’ until decision made on CHC. As the process for CHC took so long Social Services started billing and demanding payment which we paid. CHC was finally agreed after almost six months and I am now in the position of trying to reclaim fees paid from NHS by appealing due to the delay in getting dad assessed and a repeat of the DST as paperwork used was out of date and panel wouldn’t look at it! Not his fault or ours. Wonder how long that will take, if they even agree to my claim? Pauline, does the CHC funding cover the entire period? If it does not then you will likely lose the payments that you made to the Council. Did you see the article in The Times Magazine 14/6/14? Its clear this family have been led to believe that means testing comes first, then they appear to have been ‘allowed’ to get a CHC assessment once the individual’s funds fell below £23250. Its scandalous! Hi Sarah, I missed the article but it sounds about right. My father in law has been funded after a serious accident and subsequent amputations, for 6 years and now found ineligible. He has not died quick enough for the system, or so it seems. His funds were a little below the 25K mark. Yet the council has invoiced the entire cost of the home every week since CHC was withdrawn. Needless to say we have not paid. We also told them that we would not pay and to go ahead and take us to court. They have not yet done so. Nor have they corrected the amount that they can lawfully try to take each week. The poor chap that is mentioned in the invoices has no idea of what it is all about and as such cannot even be sure that what he is accounting and invoicing is even correct…… He just does as he is told. Yes that is what he told me. So he regularly risks criminal fraud and false accounting charges because he just does what he is told to do. You couldn’t make it up. Hi Sara – yes, Gail Rolfe’s article highlighted so well just what goes on – and how confusing and bewildering it can be for families who are already going through such a very distressing and stressful time.